Is Facebook paid, owned or earned? The answer is yes. Facebook is all. They integrate advertising units along with content created by brands on their Facebook pages, and allow for consumers to share their opinions right in the comments. Sometimes, ads look like social content, and it’s hard to distinguish the difference. 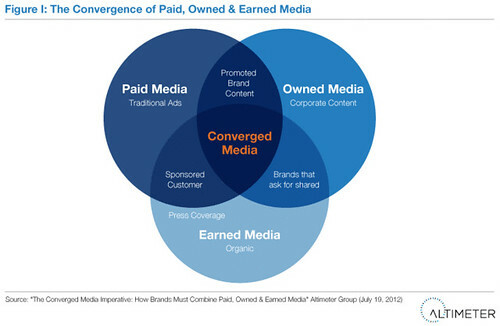 At Altimeter, we see this convergence only increasing, and these Venn diagrams will continue to have overlapping circles of paid, owned, and earned. To meet this converging media types, Altimeter kicked off a research project with Rebecca Lieb (a fantastic speaker in her own right), Jessica Groopman (expert researcher), and yours truly. We found that companies must now integrate their marketing process, strategy, and tactics so each channel leverages each other. 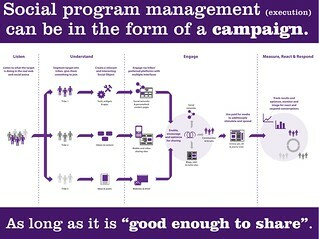 In fact, we’ve identified a few workflows that help marketers, and their agency partners do just that. If you’ve read the report, some of this is a rehash, but I wanted to share the story in the above embedded video of how I like to articulate it while on stage. So here’s all three components in one location: The report that started it all, videos from a keynote speech to 2,500 marketers at Marketo Summit in SF last month, and all the slides. Wishing you all best in your efforts to converge media. And yes, turn those phones on when I speak, not off. 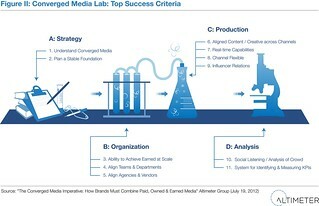 Above: The Converged Media Report. we’re proud it’s been viewed over 128k times. 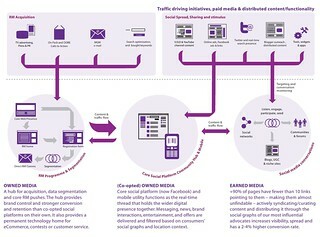 Above: The speech, from Marketo Summit in SF. Thanks to CMO and host, Sanjay Dholakia for the intro, I start around the 7min frame. Above: The slides form this report. What should 2000 marketers know about the future of digital marketing? 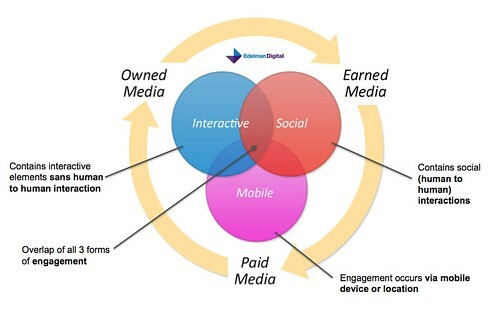 Thanks to Marketo, I’ve been asked to share recent research from Altimeter Group on how Paid, Owned, and Earned is converging into one single form of media live at their customer event here in San Francisco. In this presentation, you’ll find the highlights from our recent report on Converged Media (Open Research, which you can download and share at will) and this slideshare includes a problem statement, definition, 6 real world examples, a workflow broken down into pieces, and closing remarks. Love to hear your comments, if your brand is already converging Paid, Owned, and Earned, so we can tell your story on your success. 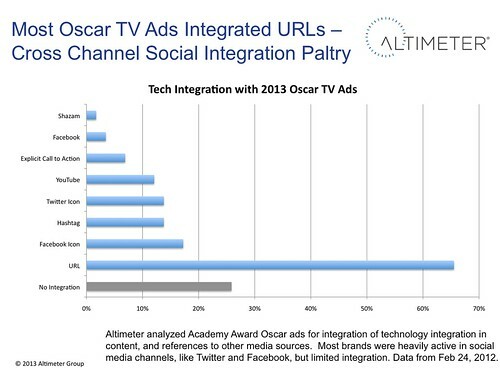 A thank you to Jessica Groopman and Rebecca Lieb at Altimeter, who co-authored this research and content with me. –CMS Wire covers the presentation, as well as Amber’s, who spoke after me. Need to learn more how Paid, Owned, and Earned are going to work together? We call this ‘Converged Media’ and it’s coming to a website near you. 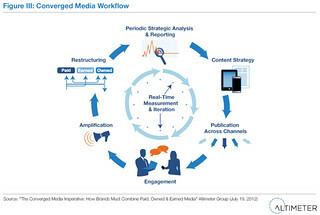 Please listen into this webinar which provides an overview from our recent research report on the Converged Media Imperative (download now), it provides business demands (with data), real world case examples, requirements for success, an examination of workflows (more here), and a list of requirements to get started. I’m pleased to be joined by my co-author Rebecca Lieb, and special thanks to researcher Jessica Groopman, and Andrew Jones. The recording is available below, please sit back, listen, and learn how companies are starting to converge ads, corporate content, and social now.